The single most important source for real estate law in the state. 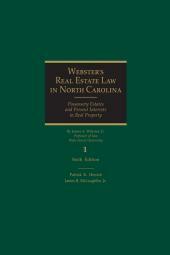 Lawyers in North Carolina have long relied upon Webster's Real Estate Law in North Carolina as their authoritative reference. 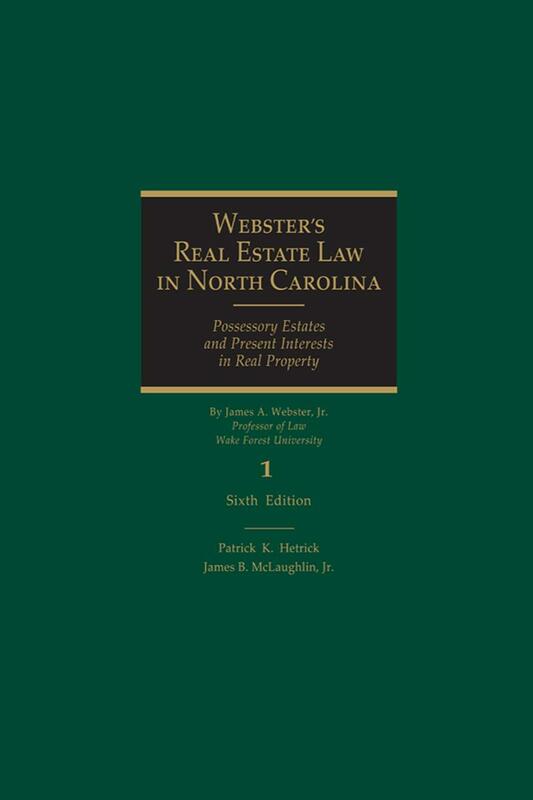 This classic handbook remains the single most important source for real estate law in the state. 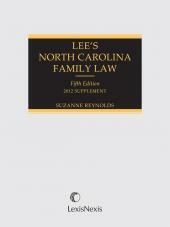 It presents the North Carolina courts' holdings on virtually thousands of questions concerning property law and contains updated standard real estate forms approved by the North Carolina Bar Association, and a new Table of Cases. 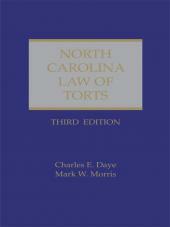 The book also covers the fundamental principles of the law of real property as developed and defined by North Carolina legislation and judicial opinion. Patrick Hetrick is a Professor of Law at the Norman Adrian Wiggins School of Law at Campbell University. 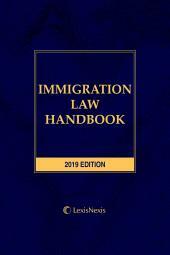 He is a recognized expert in real property law and the co-author of two leading treatises on that subject. He is a member of the American College of Real Estate Lawyers, has served as an expert witness in real estate matters, and has delivered over 100 continuing legal education presentations on real estate topics to attorneys and real estate brokers. He has taught survey courses in property and advanced real property for over three decades and currently concentrates on integrating technology in the classroom, including an online course focusing on mortgage law. His current areas of interest and scholarship include a unique seminar in Planned Community Law, a course emphasizing green communities, historic and farmland preservation, environmental issues, resort communities and mixed-use developments. Hetrick's current research includes development of a context and practice casebook on the law of Planned Communities. Jim McLaughlin is a Professor of Law at the Norman Adrian Wiggins School of Law at Campbell University. He is a well known legal expert and teacher in property law and wills and trusts law. In his role as chair of the Trusts Drafting committee of the General Statutes Commission of North Carolina, he is heavily involved in the drafting of legislation in the field of estate planning. He is a co-author of the leading treatises on North Carolina Property law and the North Carolina law of wills, trusts and administration of estates. He has served as an expert witness in numerous cases in both areas of his expertise. McLaughlin has made numerous Continuing Legal Education presentations to attorneys as well as surveyors, on both national and local levels. His teaching experience includes time served at both Pepperdine and Campbell Universities. While serving on the faculty at Pepperdine University School of Law McLaughlin was voted the school's Teacher of the Year by the law school student body. Mike Kent is an Associate Professor of Law at the Norman Adrian Wiggins School of Law at Campbell University, where he teaches courses in Property, Environmental Law, Land Use Regulation, Local Government Law and Wills & Trusts. His research has focused primarily on eminent domain, regulatory takings, and land use issues. Prior to joining the faculty at Campbell Law, Prof. Kent was a tenured faculty member at Atlanta's John Marshall Law School, teaching courses in Real Property, Land Use Planning, Local Government Law, and Wills, Trusts & Estates. For several years, he also led courses in Professional Responsibility, and he is a past Fellow of the National Institute for Teaching Ethics and Professionalism.